On Thursday, June 17, 2004, the very first edition of Son Shine was emailed to less than 70 people of various nationalities. It was titled “The 38 Factor” and told the story of a woman who married at the age of 38 and gave her testimony in a church in Abeokuta, Ogun State, Nigeria, with tears rolling down her cheeks. Her family and friends had written off the possibility of her ever getting married and even when she did, she almost lost the first child whom she was clutching. Since then, Son Shine has been emailed weekly (often on Thursday) to encourage the hopeless, tell of the extraordinary power of the Almighty God, give account of the triumph of faith and the interventions of God in the affairs of men, focus on various issues of life, highlight mysterious happenings in lives, and speak of courage in the face of odds. The mailing list has entries across continents, nationalities and religion, with receivers forwarding to a secondary list of friends, family and contacts and sometimes requesting the inclusion of such names in the mailing list. 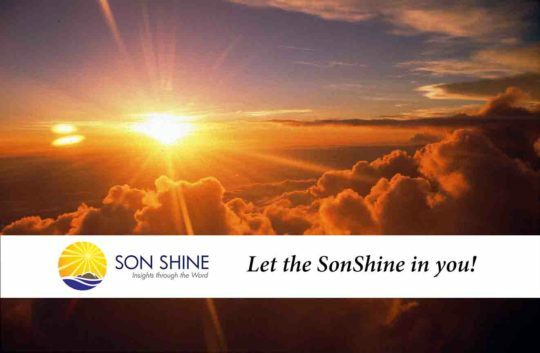 With its trademark admonition – “Let the Son shine in your heart daily” – in every edition, Son Shine is not just an inspirational, it captures the issues of life for which there is always an insight from the Bible. It speaks of the love of God through His Son Jesus who shines that light in our hearts, no matter the circumstance. Subscribers have through email, phone calls and personal contact responded to the subject matter, by either just appreciating the content, being critical, or sometimes sharing quite profound and related experiences. Based on a question by a subscriber, the first edition of “Son Shine Premium” which offers a more detailed analysis of a subject was written on November 21, 2005. Others will follow. On June 1, 2006, a medical doctor subscriber from the Democratic Republic of Congo who had expressed a strong desire to have Son Shine widely circulated in his country became the first to donate voluntarily for the mailing of Son Shine. In order to cope with the task of mailing the weekly, Ossy (as she likes to be called) became the first to assist with the mailing on August 10, 2006, followed by I.T on September 7, 2006. Noccy Girl became actively involved with sending the mails from October 20, 2011. It is through this assistance since then that Son Shine continues to be sent every week, while I reply mails at the earliest opportunity. On September 13 and 16, 2006, a Port-Harcourt, Nigeria-based banker and minister of the gospel and his wife, after reading “Son Shine 117: Longing Eyes” emailed and later phoned to offer to adopt the orphan in the story based in Gwagwalada, Federal Capital Territory, Nigeria. Although the adoption did not materialize because the guardians wanted cash, the development showed how people connected with the narratives in various editions. Son Shine is based on the personal experiences of the writer and those of people known to him. Over time, there have been suggestions from various subscribers within and outside Nigeria of the need to publish the editions of Son Shine either in book form, as devotionals or through the web, in order to enable a wider audience access to its contents. In 2004, a Lagos, Nigeria-based pastor and his wife suggested it before offering to support the hosting of a website for the series in 2006. The Lagos couple made significant progress in designing the site in 2008. In 2009, a Canada-based couple made another offer to design and host the website. On August 11, 2010, just as work on the site was close to conclusion, the platform from which the weekly mails was being sent developed complications which led to the use of an alternative platform by the following day when it was due. Ironically, edition 322 for that day was titled “Blockade”. It was in continuation of a trend where the editions which are arranged well before their sending tend to be lessons in divine coincidence. On September 30, 2011 the Canadian couple again purchased a separate hosting account to make the Son Shine website even more efficient. What you are now seeing is therefore the culmination of an experience. To God alone is the glory.